Sorry it has taken me a while to update you all on my life. I've been really busy lately. Last week I was really sick. I don't know what I was sick with, but I would say I have never been so sick in my life. Last week I was able to get the h1n1 vaccine so I am good to go now! 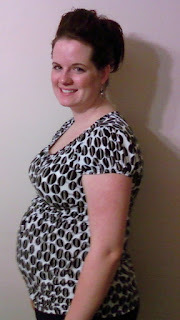 Here is a recent picture of my 24 week belly. I feel huge already and I'm not even that big! Yesterday I had my OB appointment and when the doc put the doppler on my belly to listen to her hearbeat she kicked it really hard! He laughed and asked me if I felt it, and I said "yep!" and then she kicked it about 3 more times. Then this morning around 6:45 I woke up to lots of kicking. I was laying in bed for a bit and put my hand on my stomach. I counted about 20 kicks in 5 min. Then Blake's alarm went off and I told him the baby was kicking and asked him if he wanted to feel. Of course he said yes! We felt the baby kick about another 8 times in the last 2 minutes that his hand was on my belly. A few weeks ago Blake felt her kick, but it wasn't very strong and it just felt like a little flutter. But these were really hard kicks and there was no mistaking it was a baby! This was the most that I have ever felt her move since I have been pregnant! I think we have a gymnast on our hands! We finally have our room painted! I want to wait until we have everything set up before I take any pictures. Then you can get the full effect of what it will look like when Ava gets here. We are very excited to meet our little girl! You're so cute! I'm so excited, i'm going to be her favorite. Are you feeling less sick?